At long last, I have decided to have a go at writing my own blog. God knows I’ve written many pages of comments on the blogs of others. Some of you may know me as “Kim G, Boston, MA.” Given the fact that my natural-born privacy paranoia has only been stoked by the Edward Snowden revelations, this is probably about as open as I’ll be as to my “real” identity. But here’s some background. I’m an early 50-something gay man, originally from San Francisco, living in Boston proper in a 97 year-old house which I bought and renovated, now with two cats and a housemate, who’s been recruited to look after the place when I travel. I retired from a career in the financial industry about a year and a half ago to work for myself. I’m a good cook. I bake my own bread when it’s not too hot out. I have vegan tendencies at home, but eat meat in restaurants, and occasionally grill my own steak. I love food from around the world. I garden. I ride a motorcycle, though that’s likely to end soon as it sits mostly unused in the garage. I keep up with the news, with a heavy interest in the financial news, economics, and international issues. I enjoy photography, and like to travel. I love music of all kinds and play the accordion. My friends say I have a great sense of humor, and I definitely find the world filled with hilarious contradictions and absurd juxtapositions. Over the past eight or nine years, I’ve probably spent a month per year in Mexico, mostly DF, but “F” and I have traveled around the country quite a bit. Sadly, after seven and a half years, “F,” (whom I still love dearly) and I broke off our relationship. This happened nearly a month ago, and I’m still trying to recover. “F” lives in DF and teaches high school there. Suelto is the past participle of the verb soltar, which means to “let go” or “unleash.” Suelto itself can have many meanings. Free or loose is one of them. But it can also mean “unleashed” or set free. For example, Un animal suelto, is an animal that may have escaped (like from a zoo or something) or may be merely unleashed like a dog running around a park. Soltarse can also mean to come out of one’s shell, or to break free, or cut loose. Freed from a job and financially independent, I am now officially suelto, and I’m going to write about my adventures, past, present and future. Hopefully my life will grow more suelto as I continue this blog. Where some of you know me for these taglines. We’ll see whether they work for blog posts. P.S. 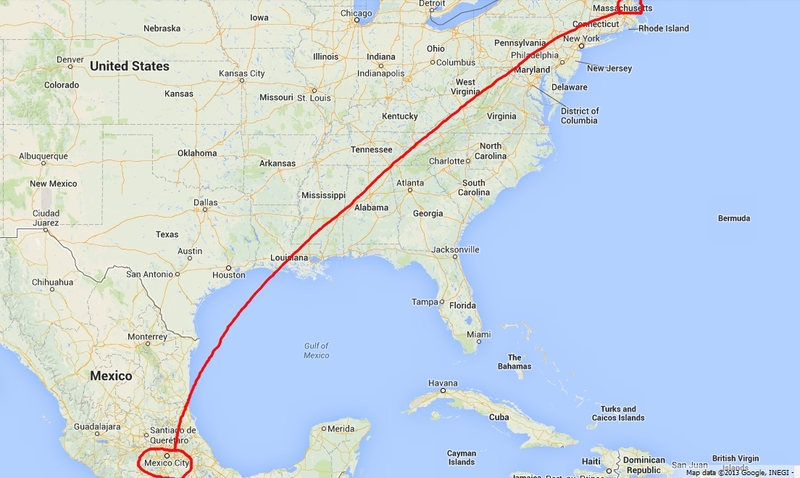 Despite the map above with the red line, there are NO nonstops from Boston to Mexico City. Unfortunately. Welcome to Blogland Kim G! I found your site through Steve’s Blog. You are not a stranger as I have been looking forward to your many comments on other Blogs and it is nice to finally see you take the plunge yourself. We have travelled every State in Mexico in our motorhome except the DF so I look forward to reading about your adventures. I shall be following along! Thanks so much for reading along. I’ve enjoyed your comments too! Thanks for commenting here. Saludos. Welcome aboard the Blog Express. This is going to be a fun ride. But I was sorry to hear about F. I really enjoyed talking with the two of you. Thanks…I’m still quite broken up about it. We’ll see what happens. I’m amazed that I’m already getting so many pageviews! Wow! Cool that you decided to get in with the big dawgs – I have been a fan of your comments for some time. Expect the transition to fellow Blogger will be smooth. I plan on linking to here; without objection? I would be honored. Thank you very much! LOL…thanks, and thanks for commenting. Looking forward to your future posts. You have always made well founded comments on the other Latin blogs. Thanks for the kind comments! I’ve enjoyed yours too! I’ve been called “suelta” and knew it was meant to stop me short, maybe even insult, to which I replied “Gracias”. Thanks for commenting. I went to Rice undergrad. You? At some point I’m going to ask you for some technical tips on managing this thing. Thanks for reading. I’m thrilled you’ve finally broken loose and are writing. It’s a great adventure that has its own twists and turns that, at present, you can’t imagine! Welcome to the club………..